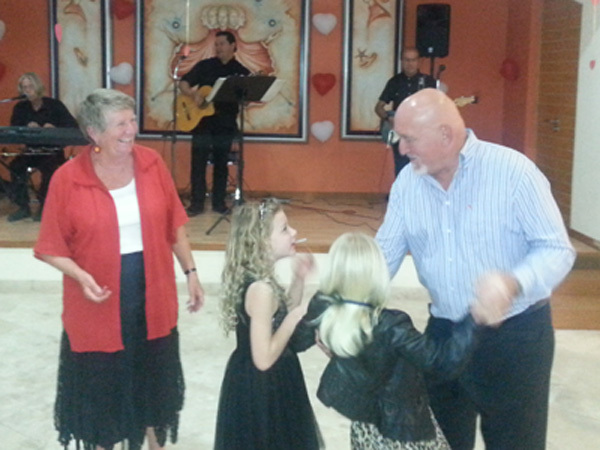 We have remained true to our goal of spending time with each of our grand children on their birthdays. 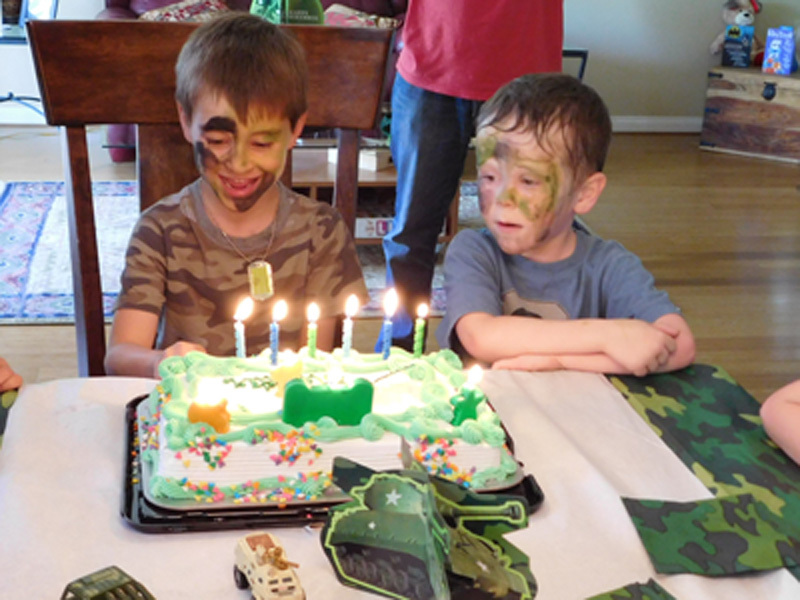 Hunter (the little soldier on the left) turned six on the 18th and is getting to be a big boy. 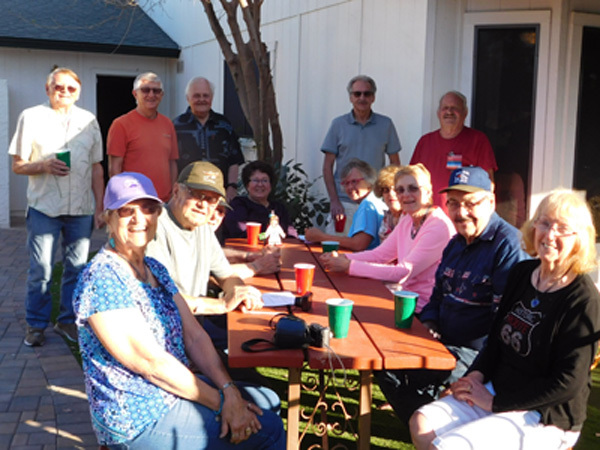 In addition to spending time with him in California, we got a chance to meet up with a bunch of Larry's cousins at a Barnhardt reunion in Arizona. 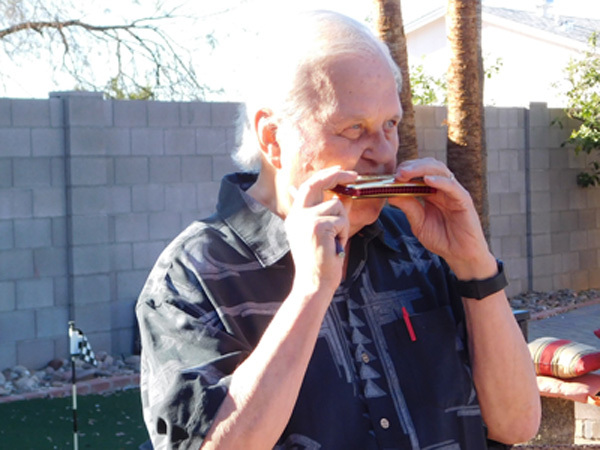 Jay Shuffle, Larry's harmonica professor back in 2008, passed away in his sleep on Valentine's Day. He was a friend and one of many great performers who made Ajijic such a special place. Jay, you will be greatly missed. 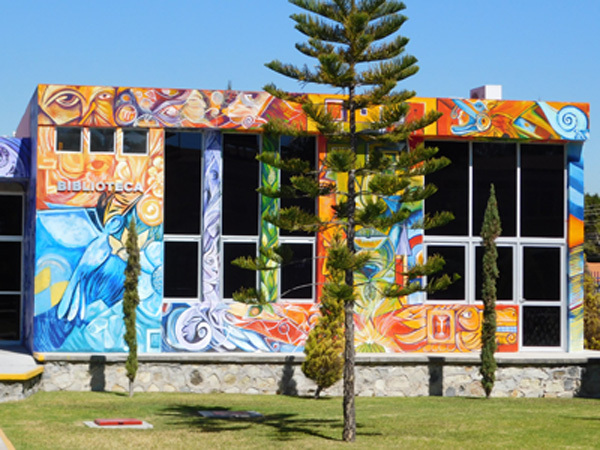 On the campus of Chapala Preparatoria is this Biblioteca, which means library in Spanish. 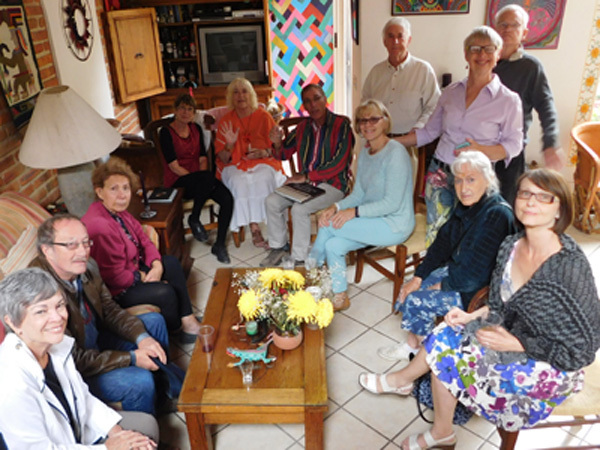 This is where Glorine met with her volunteer group to help plan and organize Lake Chapala Society's second annual Career Expo on March 15. 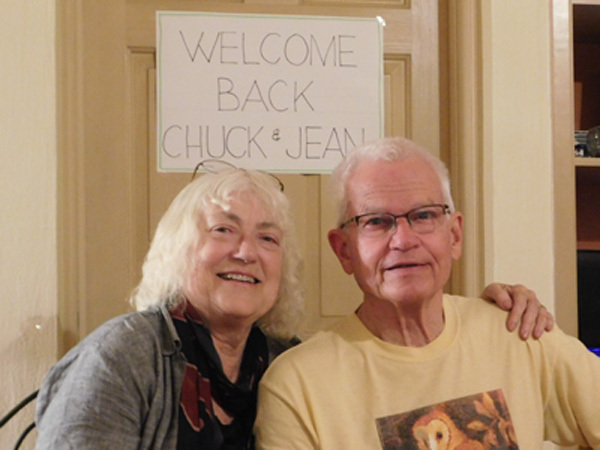 Friends Chuck and Jean left Ajijic for Oakland, CA in December so Chuck could get treated for cancer. 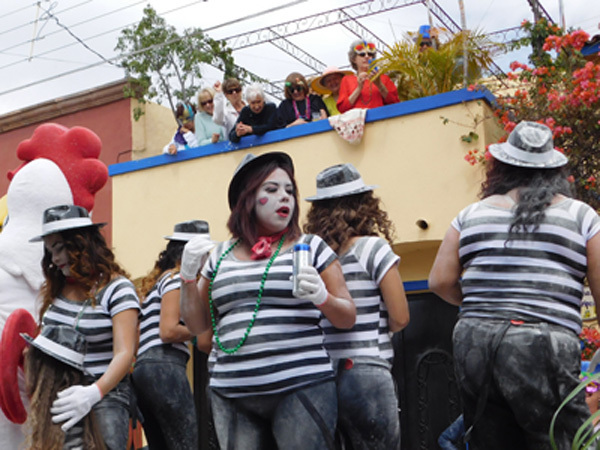 But it was scheduled for late March, so they came back to enjoy more time here in Ajijic. Friends Ross and Carol's daughter and grandkids joined them in Ajijic for a week. 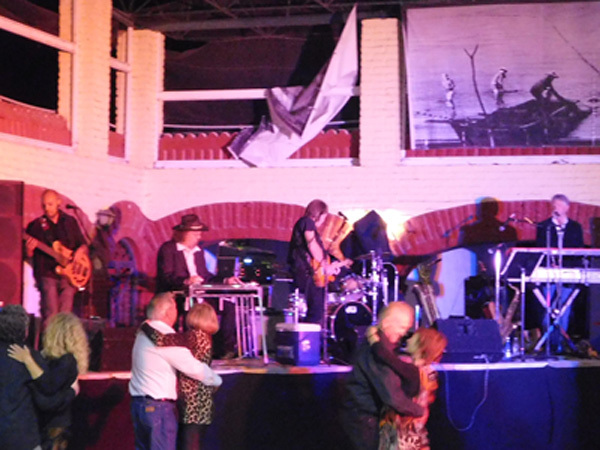 They hired Noe and the Band and invited 90 friends to join them in a great evening of music and dancing. Friends Phil and Mary hosted their annual Mardi Gras get together including a wonderful potluck brunch and lots of Mimosas. We got the group to pose for pictures before the parade started. This is one of the many floats that paraded past Phil and Mary's home. Their balcony made for a great grand stand and allowed friends to watch without getting pummeled with flour. Have Hammers (a carpentry school for local kids) hosted their best annual fundraiser at a new venue this year. 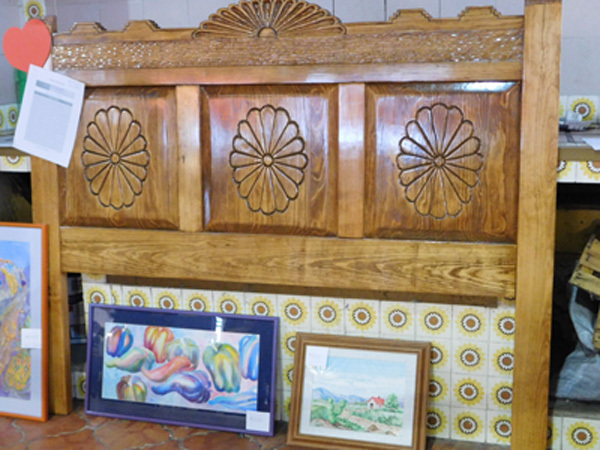 Here is one of the beautiful pieces of furniture that were on the silent auction. This event attracted over 450 people. One of the reasons for the large crowd was that this would be the final appearance of The Tallboy Band, who are going on a hiatus after years of playing. 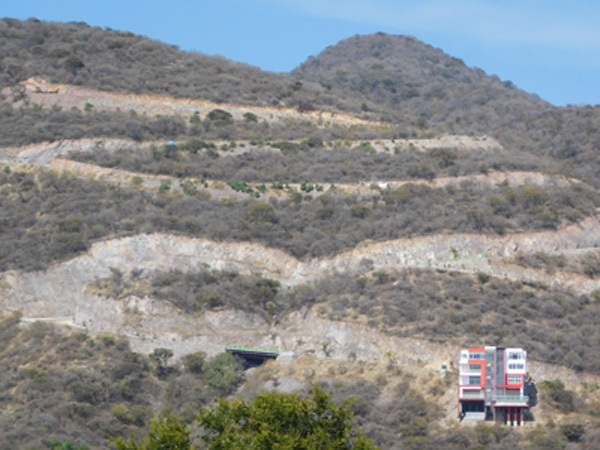 Some call this development a scar and some an engineering marvel. We took a hike to the very top and decided it is the latter. The house is a five story one family home selling for $2.5 million. 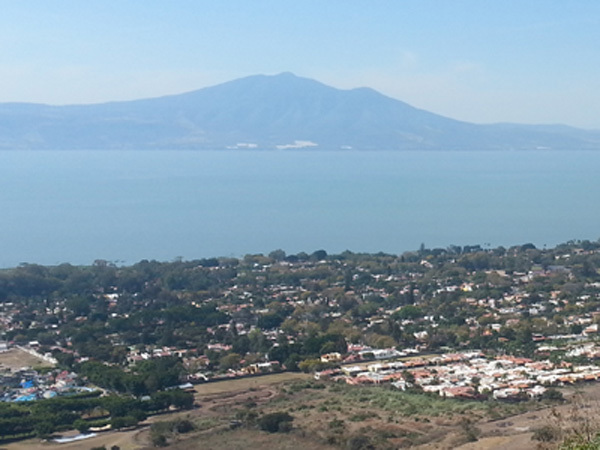 And here is a view from the top with the village below, Lake Chapala and Mount Garcia on the horizon. Don't think we could afford this view any time soon. Friends Keith and Maureen invited us out to Adelita's to celebrate Valentine's Day. This summer they will be tracing one of our RV adventures--along the Pacific Coast Highway of CA. We flew to CA to spend time with Hunter as he celebrated his sixth birthday. 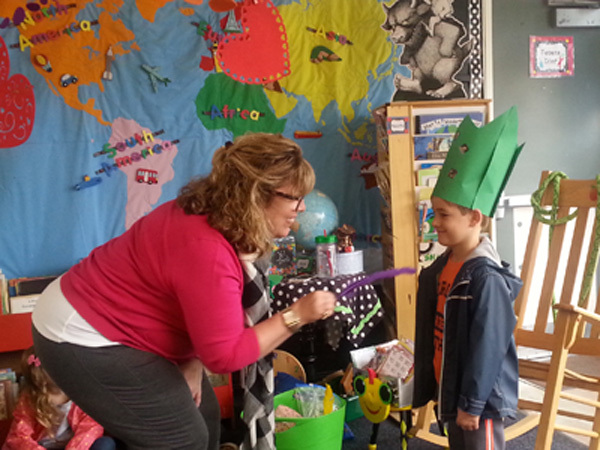 His kindergarten teacher (Mrs. Higges) is tickling him with a feather to see if she could make him laugh. The theme of the party was "ARMY." 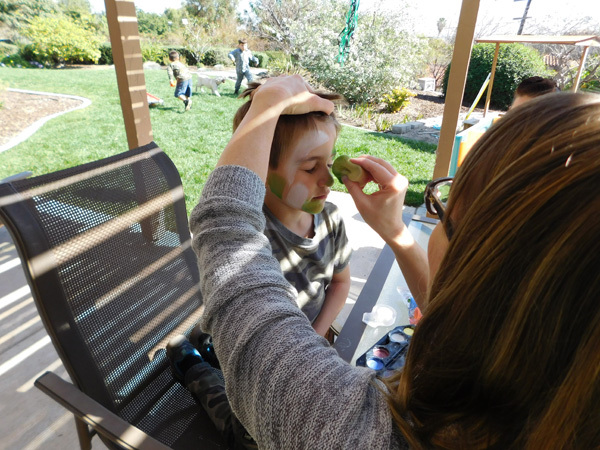 And here Carmen is applying camouflage paint on Hunter face in preparation for the upcoming war games. She also painted butterflies on most of the girls. 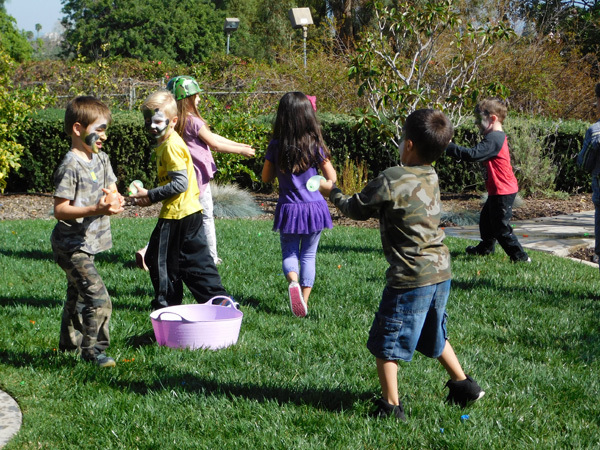 The party started on Friday after kindergarten left out and about half of his classmate came over to celebrate and play games with him. Here they are tossing grenades (water balloons). 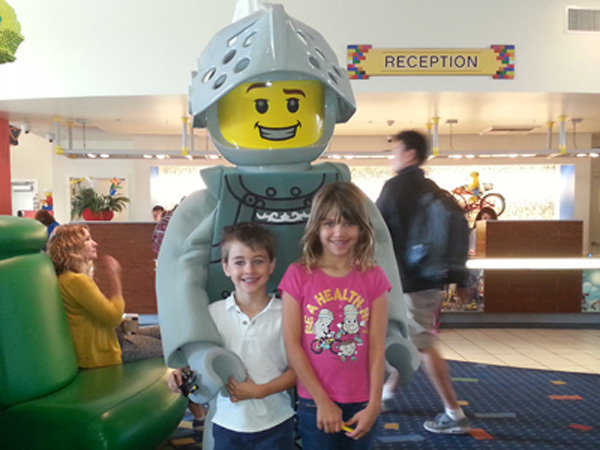 We spent Saturday night at the LEGOLAND Hotel near San Diego, which is what Hunter requested for his birthday. As you can tell he and sister Sierra enjoyed their stay. 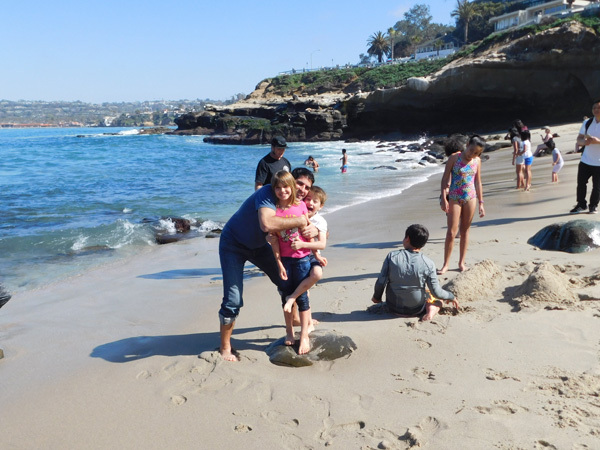 From LEGOLAND, we explored the La Jolla Cave and spent time here at La Jolla Cove where the kids did not hesitate to get soaking wet despite not having their swim suits on. 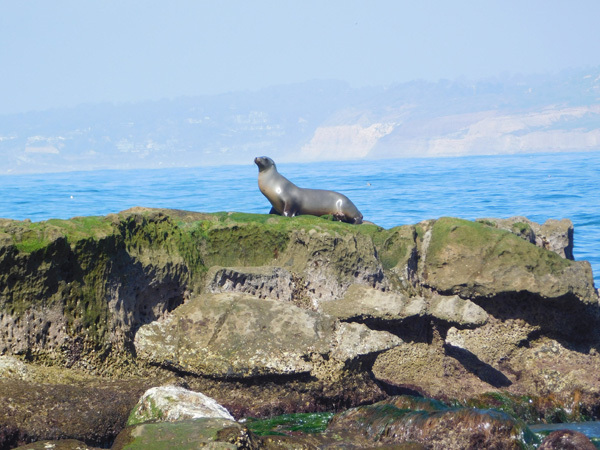 We caught this sea lion sunning itself and enjoying the view of the ocean overlooking the cliffs. These lions are different from seals, as they have 4 flippers to get around on land as well as at sea. 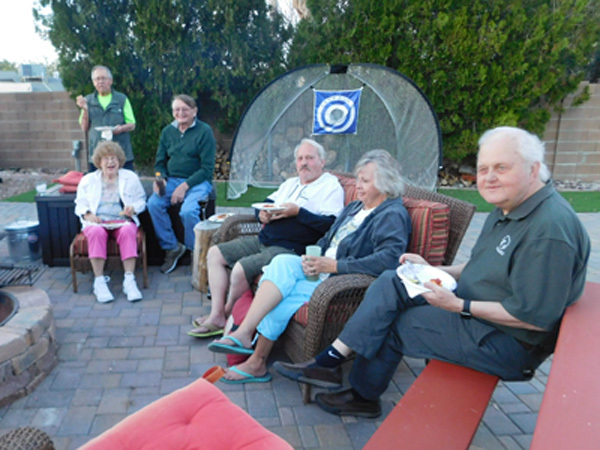 We attended a Barnhardt Cousin's Reunion in Mesa Arizona. 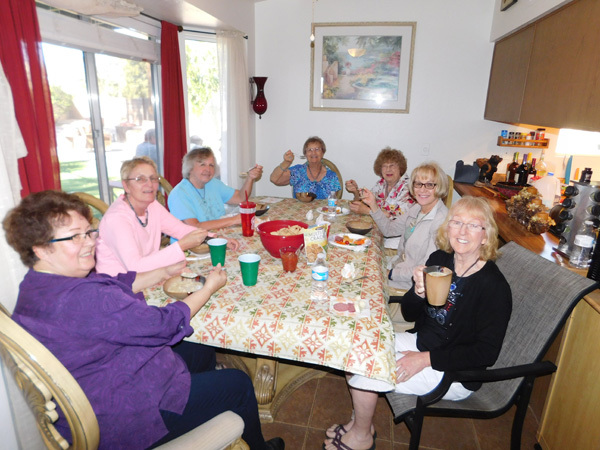 Cousins came from North Dakota, Alaska, Washington, Oregon, California, Arizona, and we flew in from Mexico. 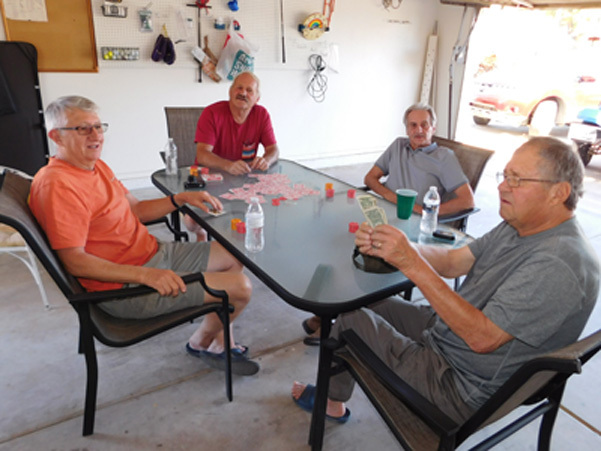 Here Darrel, Jerry, Dennis and Larry played dealer's choice poker in the garage most of the day. 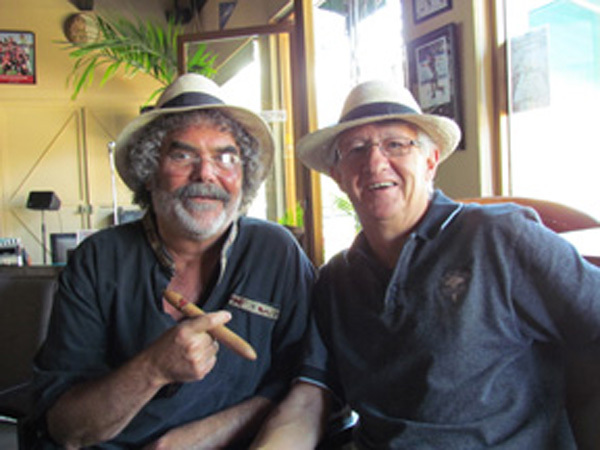 Dennis (right) didn't know that he was going to say farewell to those dollar bills! 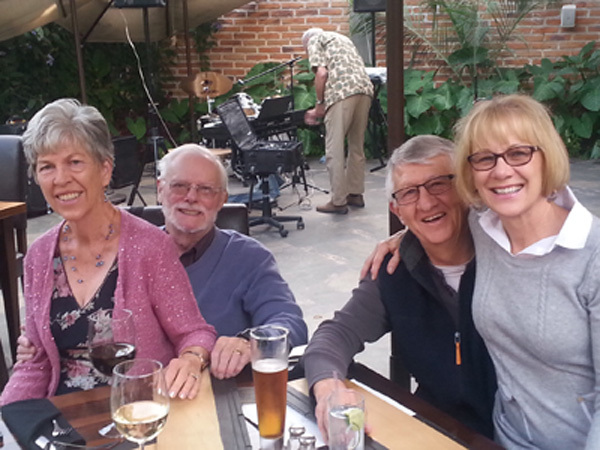 The Barnhardt clan hail from German stock and sure enjoy those home cooked German meals. Doreen (left) prepared Knefla soup from scratch and brought ingredients with from North Dakota. Dr. Ray, authored the Barnhardt Genealogy and emceed the Barnhardt Trivia Quiz. He got our attention by playing the harmonica. We split up into two groups and after 20 questions, we tied with 17 correct answers each. We rented this four bedroom vacation home with a pool, hot tub and all the amenities we needed to create a great environment for the reunion. Games, eating and lots of storytelling filled our time. It was a hit! We drove back to California in time to watch Dakota and her 5th and 6th grade classmates perform the musical Sound of Music. 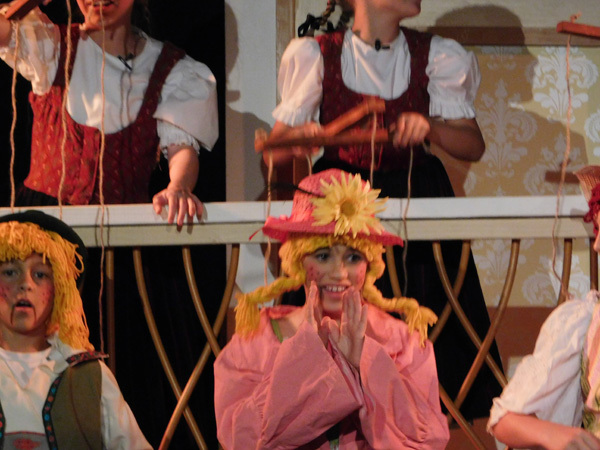 She did a wonderful job at playing a dancing puppet. While driving Dakota to swimming practice, Mike got hit by a lady running a red light. Their Saturn got destroyed. 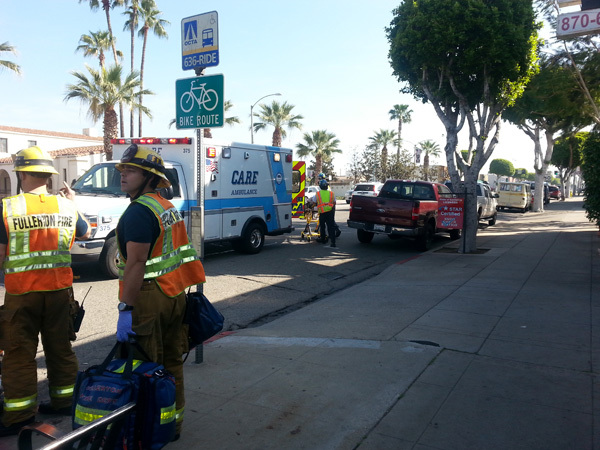 The lady was taken to the hospital. Thank God, Mike and Dakota only sustained minor bruises. It was pretty scary! 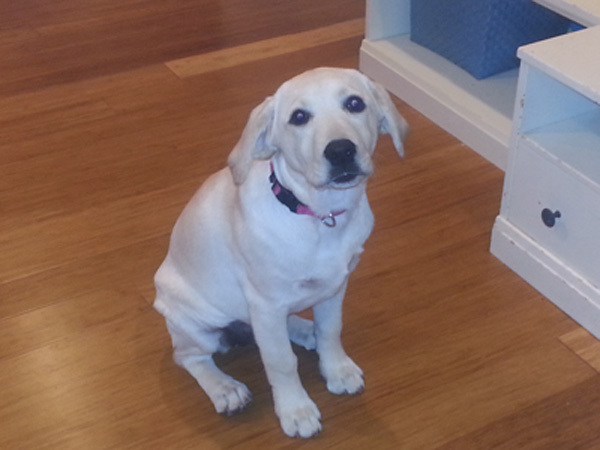 We met Penny, the newest addition to the Barnhardt family. She is a pure English Golden Retriever. Cute as a button and smarter than your average dog--and lots of fun to play with. 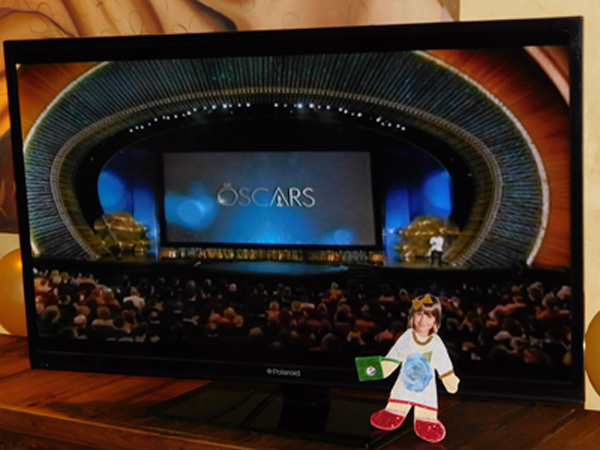 We flew back to Mexico in time to join friends at an Academy Award party. We brought Flat Sierra with us to join in on the fun along with our upcoming adventures here in Mexico and the South Pacific. February's web page includes February 1 through February 29.